I'm really looking forward to this year. Each year that Mason gets older is a whole new year of fun possibilities! I'm not calling these resolutions as such, but there are a few things I'd love to do by the end of the year. It will be nice to look back and see how many things I achieved. I've learnt who really matters in the last few years and they are the people that are worth my time and effort. I wasted a lot of my life trying to make people happy who didn't deserve it so I'm making damn sure I'm spending time with great people and treating them whenever I can. I have some absolutely amazing people around me and they deserve to be spoilt! I'm pretty good at eating well but I know I should eat more fruit. I'm going to make sure I buy a different fruit every week and get through the lot. There's probably loads I haven't eaten in years and need to rediscover! Doing my monthly summary posts made me realise I don't read enough. Each month I tried to write down what I read and I struggled each time! This year I'm going to read more. I spend enough time scrolling through twitter in bed, this time could be spent reading something decent! I have so many books on my wish list too, its time to get through a few of them! My brother lives a couple of hours away from me now and he doesn't get to come back and visit as much as we'd all like. So this year I plan to go and visit him and his lovely girlfriend in Essex. I'm sure I'll be a complete tourist pointing out places like Sugar hut and saying 'shutup!' all the time -he'll never want me to come back! Back when Sam and I worked together we were sent to Birmingham with work to train some new staff. We weren't a couple then but we both knew there was something between us. We were sent to do training at different times and I always felt like we missed out on a great week away in Birmingham -which is a town I really fell in love with. We've always planned on taking a trip there together and having the time together that we missed out on -minus the work! This is one that might not happen but as a huge Disney lover I've always dreamt of taking my kids to Disneyland. We've been wanting to take Mason but wanted to wait til he was the right age where he would understand any waiting around, he would appreciate it and also be able to handle the busy days. I think he's getting to that now and he watches so many different Disney films I think he'll really love seeing everything. We're playing it by ear and also I want to wait til the weather is nicer as Disney for me would be ruined in the cold! I don't like cold weather one bit and I hate carrying things around! I make my Mum a calendar every Christmas and I always struggle to get enough photos together for it. We all spend so much time together but never really take any group photos. This year I'm going to make it happen! I spent every Summer at the beach and I love to swim. Last year was the first year of my life that I didn't visit a beach! I'm making damn sure I make up for it this year. The beach is one of my favourite places. Back when I had a lot more disposable income I used to see musicals almost every month. There are a load of shows I've been wanting to see so Sam and I have decided we really want to make sure we see one by the end of 2015. Time can fly by and I like to try and fill that time with things that made me happy. This one should be easy enough to do but I want to make sure we have something to look forward to each month. Whether it be a date night, a trip out as a family or seeing friends. I have to admit I think New Years Eve is really over rated. I actually can't remember ever having an amazingly brilliant big one! MY favourite was actually the one just gone where we had a relaxed evening in drinking champagne and playing games with our best friends. We all decided that we want to try and do something big where we can properly dress up next new year. I really want to go somewhere I can have an excuse to wear a proper fancy dress! With a big of saving up and forward planning I think it can definitely happen. 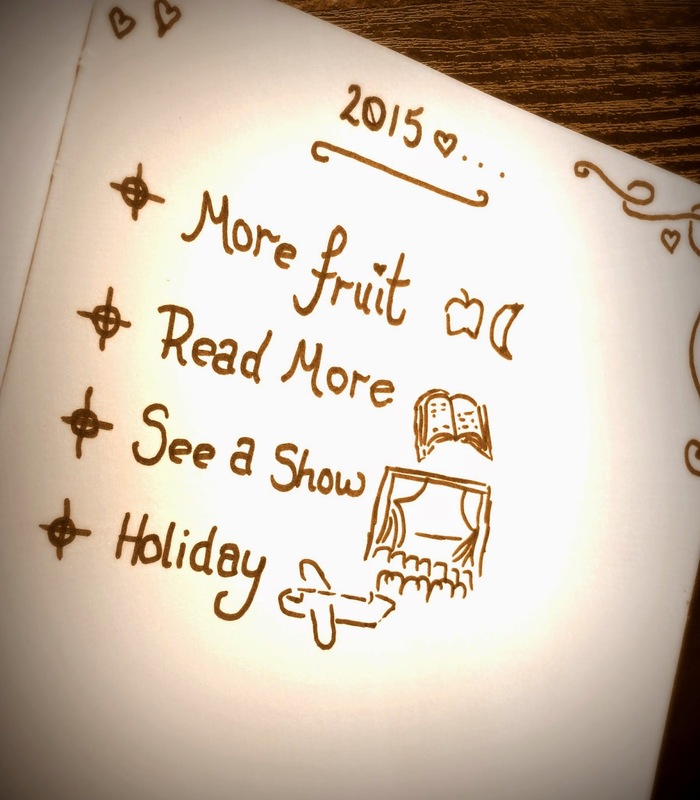 Have you got any plans for 2015? I don't normally do resolutions, but I love that these are just things you want to do. Such great things to try to accomplish. The Birmingham trip shoul definitely happen! :) oh and you'll love Disneyland! I too am trying to read more. It is one of my passions and yet I hardly have time for it. I love these goals! Eating more fruit is on my list too! You have some great plan for 2015, good luck with them! I also want to eat more fruit and drink more water, it is such a better way to live.